Foodbuzz is running a bacon-themed contest, so I decided to get into the kitchen and crank out some bacon desserts. First up is a simple but elegant bacon dessert with fruit, so the artery clogging is balanced out. Kidding. I liked the pears because they have a neutral flavor, though any fruit like peach and other stone fruit would work as well. 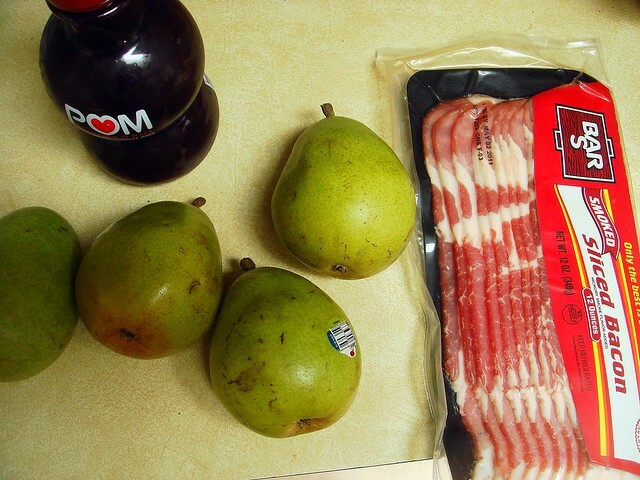 The necessary ingredients are pears, bacon, sugar, and POM juice for the sauce, though you could substitute a red wine if you preferred. 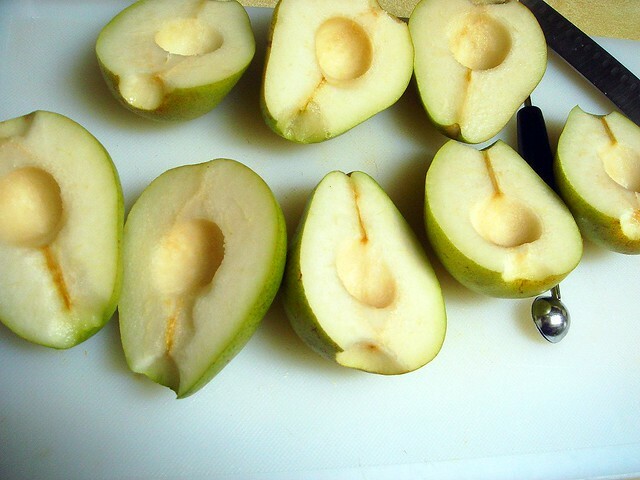 I sliced the pears lengthwise, then scooped out the cores and the bottoms and stems. 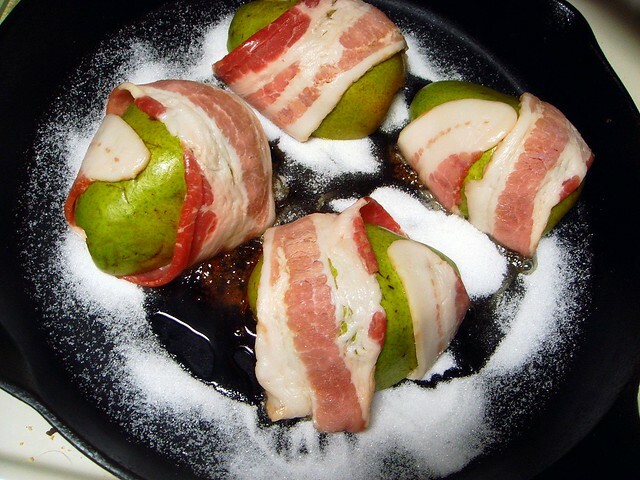 I then wrapped each pear half with a slice of bacon. I meant to buy toothpicks to pierce into the fruit so the bacon stayed in place, but I forgot. I would suggest doing it. When the skillet heated up, I sprinkled sugar in the skillet and placed the pears, sliced side down, on the sugar. 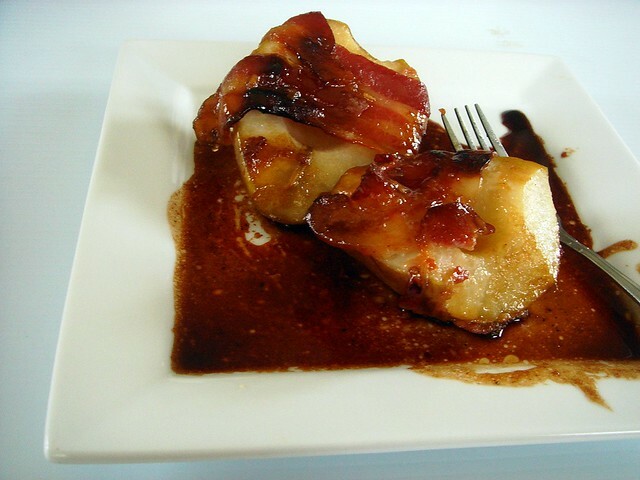 I wanted the bacon to pan fry in the caramelized sugar and develop a sweet, crispy, and chewy texture. The bacon cooked up great like this. After I flipped the pears and cooked the other side for a few minutes, I transferred the pears to a parchment lined baking sheet to place in the oven. I had to scrape out the caramelized sugar before cooking the other four pears because it had cooked too much and tasted like burnt sugar with essence of bacon, which still was surprisingly good. I munched on burnt bacon caramel while I finished up the remaining pears. You may question how I have any sense of taste left, but don't worry about me. After cooking and removing the other pears, I added a tablespoon of butter and POM juice to the skillet, then let it cook down a bit to reduce and thicken. As the sauce cooked, the pears were baking nicely in the oven. They were a bit firm to begin with, but the texture came out great afterward. Easily sliceable, but not mushy. I was pretty happy with the outcome of this recipe, and I liked how simple it was to make a tasty fruit dessert that didn't need a pie crust. Try it out if you're a bacon fan. Preheat oven to 350 degrees. Line a rimmed baking sheet with parchment paper; set aside. Slice the pears lengthwise. Scoop out cores and stems. Take a slice of bacon and wrap it around one half, securing ends with toothpicks (press them in deep, leaving enough of the end sticking out to remove before serving. Repeat with rest of pear halves and bacon. Heat a large skillet over medium. When hot, sprinkle with 1/3 cup sugar. Immediately place pear halves on top, cut side down. Cook for 5 minutes; carefully flip over and continue cooking for another 5 minutes. Remove to baking sheet and place in oven. Discard caramel in pan onto a sheet of foil to cool before throwing out. Add remaining sugar and repeat cooking process. 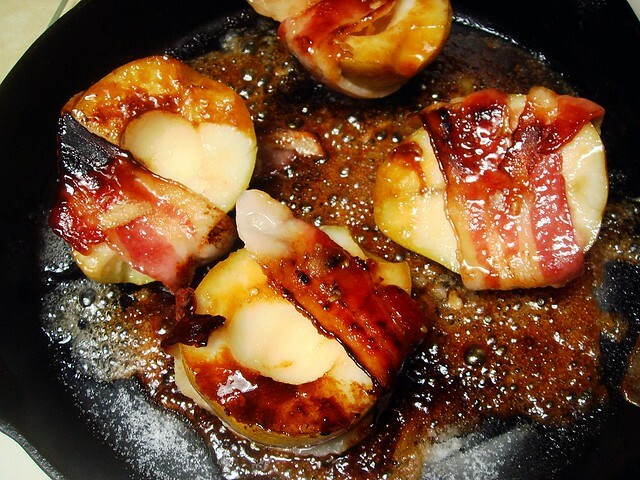 After pears are removed from skillet, add butter and stir. Slowly pour in POM juice, stirring with a whisk constantly. Let cook on medium for about 5-7 minutes, until thickened and reduced. Spoon sauce onto bottom of plate and top with two pear halves. Enjoy! beautiful! 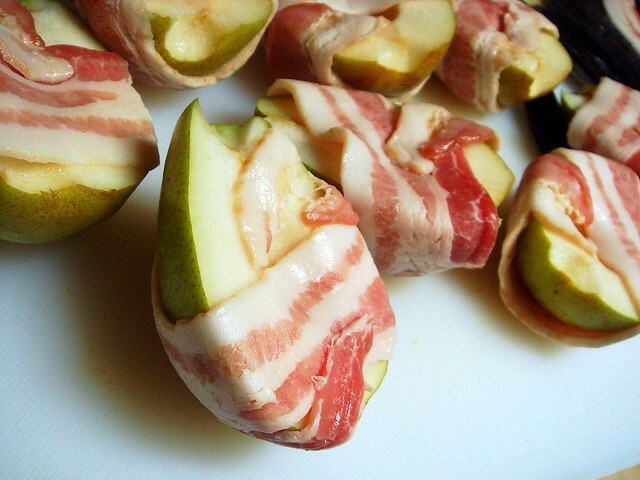 my husband would love if i made these for him...pears are his favorite fruit & bacon is his favorite food! Pajama Chef - Thanks! It definitely made for a different kind of dessert.